All sales on the items mentioned above are final and non-negotiable. Ring purchases – upon receiving your order for a ring on-line, The Highland Shoppe will send a ring sizer to you so you can confirm your size if you request this. Returns must be made within 15 days of the shipping date and must be in same condition as you received the product (unused and resaleable). If the product being returned exceeds $150.00 before tax, a 15% re-stocking fee will be charged for exchanges. For returnable items, please email the highlandshoppe@telus.net immediately. We will email you a Return confirmation. If the product was sent in error or is defective, we will refund the shipping charges when the refund is processed. The cost of shipping the exchanged merchandise is the responsibility of the purchaser. We only refund shipping charges if the product was sent in error or is defective. Please ensure that you add appropriate insurance as the returning item is the purchaser’s responsibility until it is received by the Highland Scottish Gift Shoppe Ltd. If you are an International customer, please mark on the outside of the parcel being returned “RETURNING CANADIAN GOODS ZERO (0) VALUE” and ship using your national post service. Straying from this may result in customs and brokerage charges for the Highland Scottish Gift Shoppe Ltd. which will then be passed onto you. Exchange: Your replacement item will be sent as soon as possible via Canada Post. We will cover shipping costs only if the item exchanged was originally sent to you in error or was defective. Otherwise, shipping and any other costs will be the responsibility of the purchaser. We reserve the right to choose the shipping company used to deliver our products to you. Canada Post is our primary shipping company. Like other shipping companies the post is based on the greater of volumetric weight (length x width x height = volume) or actual weight. This means that when buying a light but bulky item such as a pipe bag, your shipping rate may be higher than expected due to the unconventional size of the item. You may request us to use FedEx or Purolator, however, we cannot be held responsible for the fee of such couriers. Rentals are always dispatched via FedEx. We will bill your card when we are shipping the Rental Outfit to you. Your credit card will be charged upon placement of your order. Upon placing your order, your payment details are stored on PayPal (very secure). 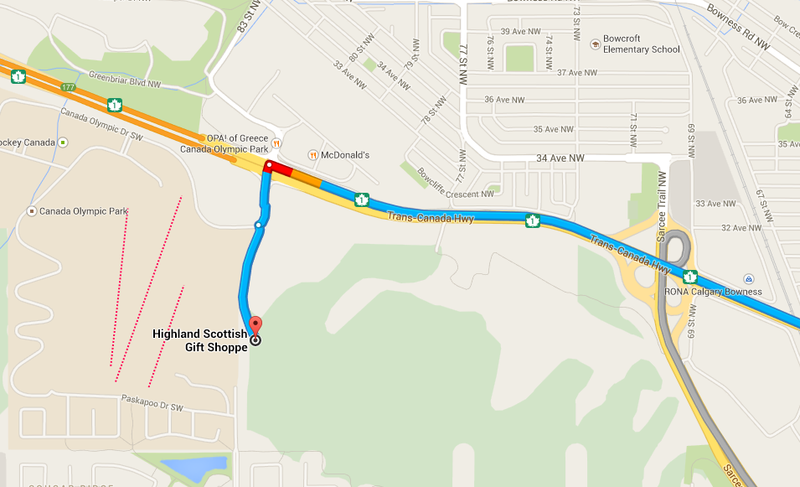 The Highland Scottish Gift Shoppe Ltd. strives to deliver your product in a timely and efficient manner. However, we may experience shipping delays from Scotland or Ireland and not be able to deliver on the dates outlined per our Shipping and Delivery schedule. Please refer to the individual Shipping and Delivery section under the specific product your are ordering to see approximate delivery times. The Highland Scottish Gift Shoppe Ltd. is not responsible for any delays caused by any of the shipping companies used to deliver your product to you. All prices are in Canadian Dollars excluding taxes. GST will be applied where applicable.